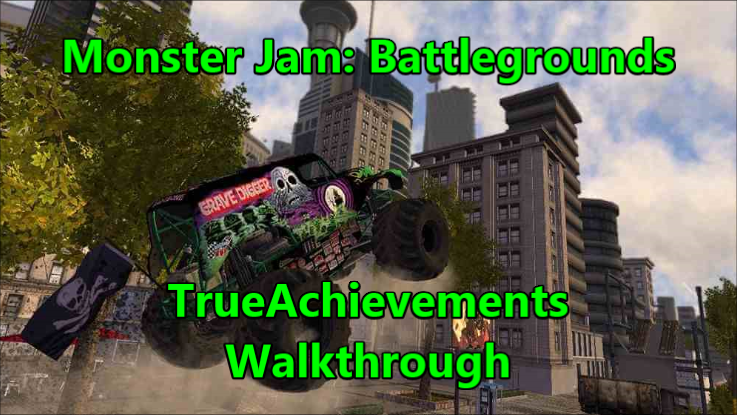 Hello and welcome to the TrueAchievements walkthrough for Monster Jam: Battlegrounds! This is a vehicular “platforming” title, somewhat in the tradition of games like Trials HD. However, it’s several steps below that quality-wise, and if you’re here, then you’re likely playing it purely for the points it offers. This is a super easy completion apart from maybe one or two of the stunt mode levels. The race levels give you a significant head start over the opponent, so they’re beyond simple to 3-star. The skill mode levels are pretty generous with their time allotments, and most of the stunt mode challenges are quite easy to accomplish. It’s essentially a very basic representation of the Monster Truck/Monster jam shenanigans that are somewhat popular within the US, although I hear that popularity might be spreading abroad. In these events, supped-up vehicles with enormous tires do tricks, races, smash cars, and generally burn through massive quantities of petroleum-based fuel for no reason other than to have fun and create a big spectacle. Well, that and the competition between drivers, of course. The nature of the achievement list doesn’t lend itself well to a step-by-step guide, as the vast majority of the achievements simply require you to play through each of the games levels and get three stars on all of them. Having done that, you would only have four other achievements to possibly get: two for unlocking a couple of the game’s monster trucks and two for doing a front-flip and a back-flip. You’d likely get the backflip one by accident even without trying though, so without even looking at the list, you’d get all but three achievements if you three-star everything (assuming you manage to ‘lose’ one of each type of event anyway). That being said, I’ll be focusing on taking you through what I feel is the most efficient path to completing the game. Without using a guide, I clocked in right about four hours for the 1k, so feel free to just play through the game and attempt to three-star everything, and just check back on the WT if you get stumped by a particular challenge. Odds are if one of them stumps you, it’s one that I have tips for in the challenges section. I won’t be breaking down each and every event, as they’re all extremely simple and relatively short. I think the longest course might be around a minute in length, but most are 30 seconds or less. Instead, I’ll be outlining some general strategies and focusing in on tips for what I feel to be the only potential stumbling blocks, even for the most modestly-skilled players. There’s only one tip, so I’ll include that here: be sure to use the rewind feature. Activate it by clicking the right thumbstick, then rewind via the left thumbstick. Keep in mind that on the timed courses, time doesn’t stop while you’re rewinding, so you’ll have to use it judiciously. Make too many mistakes on a timed course, and you’ll likely just need to restart rather than trying to rewind so that you have enough time to three-star it.